By John S. C. Abbott. The story of Napoleon Bonaparte’s stepdaughter—and mother of Emperor Napoleon III—is as interesting as those of her more well-known family members, as revealed in this penetrating study by master storyteller John S. C. Abbott. Written while many of the personalities discussed in the book were still alive, this work tells of the life and times of Hortense Eugénie Cécile de Beauharnais, who was the daughter of Napoleon I’s wife from her first marriage. Her father was executed during the French Revolution’s Reign of Terror, and her mother was only saved from the guillotine by Napoleon’s intervention after his election as consul. As her stepfather became ever more powerful, Hortense was persuaded to marry Napoleon’s brother, Louis—who in turn was appointed King of Holland. 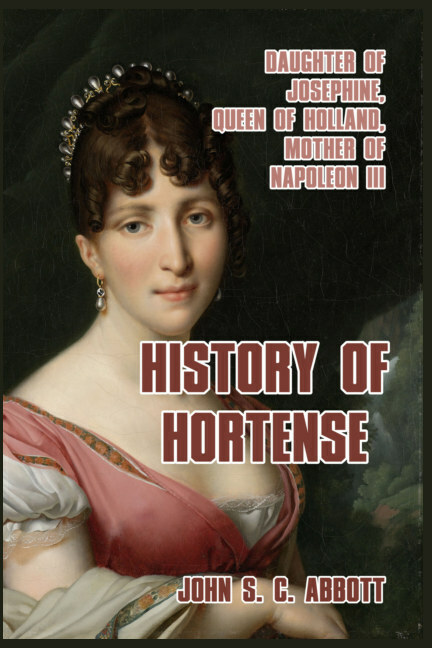 Hortense subsequently took up the position of Queen of Holland during her stepfather’s four years of greatest power from 1806 to 1810. Her marriage was an unhappy affair and after she was allowed to leave Holland, she never lived with her husband again. Her family distress was multiplied by her mother’s divorce from Napoleon I, and his later downfall which plunged the entire family into great danger. 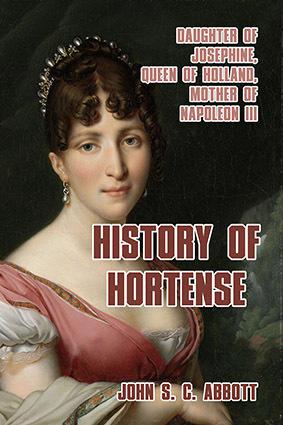 Hortense received the protection of Alexander I of Russia after the restoration of the Bourbon King Louis XVIII, but her open support for her former stepfather—still her brother-in-law—Napoleon during his “Hundred Days” return to power after his exile in Elba, led to her banishment from France after his final defeat at Waterloo. Hortense traveled in Germany and Italy before purchasing the Château of Arenemberg in the Swiss canton of Thurgau in 1817, where she lived in exile until her death in 1837, aged fifty-four. Her son, Charles Louis, would later gain fame as France’s Emperor Napoleon III. This work forms part of John S. C. Abbott’s complete series on the Napoleonic era, and is a worthy companion to his related works on that time period.